My grandchildren live in three different states, so they almost never get to attend a cousin's birthday party, and as a matter of fact, I rarely get to be there for their birthdays either:( Since I knew they were all going to be together this month, I decided to throw a birthday party for all eight of them. 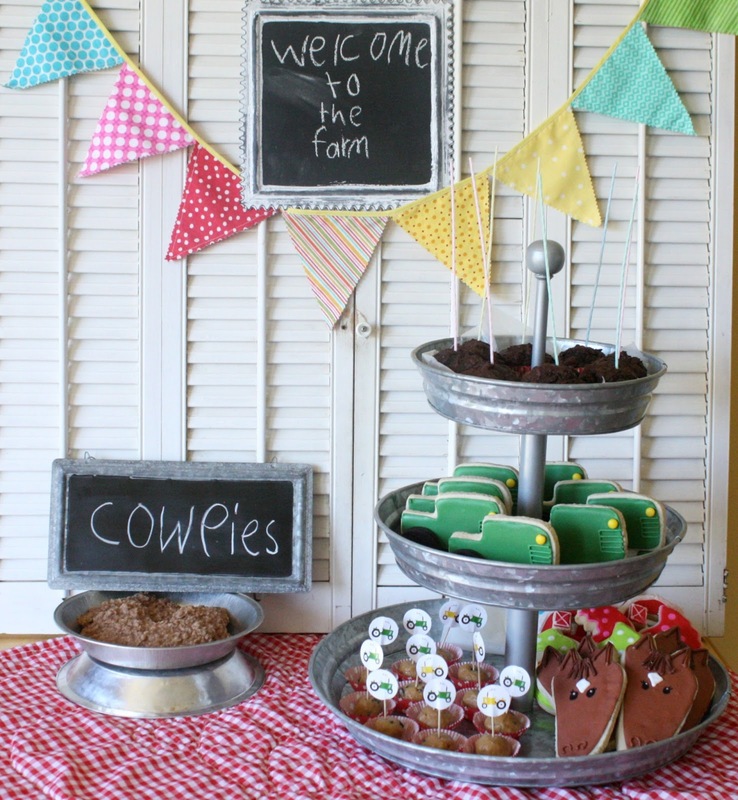 This is the dessert table. My granddaughter did a great job on the signs! I have really wanted to make these tractor cookies for awhile, so decided to have a farm party to work around the cookie:). The tractors are hand cut sugar cookies with royal icing, Oreo cookie tires (regular and mini) and yellow mini m&m details. Another plus: a farm theme is gender neutral. I ordered a cute barn pinata (see it above) from Whack Pinateria, and filled it with individual bags of crackers, teddy grahams, and 100% fruit snacks (I just couldn't bring myself to fill it with candy since they were already getting so many treats). The kids had tons of fun bashing the pinata! There was also watermelon wedges on sticks, pigs in a blanket (crescent rolls wrapped around hot dogs, baked), and baby carrots to munch on. Instead of a cake, or even cupcakes, I served the munchkins homemade zucchini-chocolate muffins (no icing), which also have mashed sweet potatoes in them. I first cut this muffin recipe from a magazine years ago and it's a family favorite. 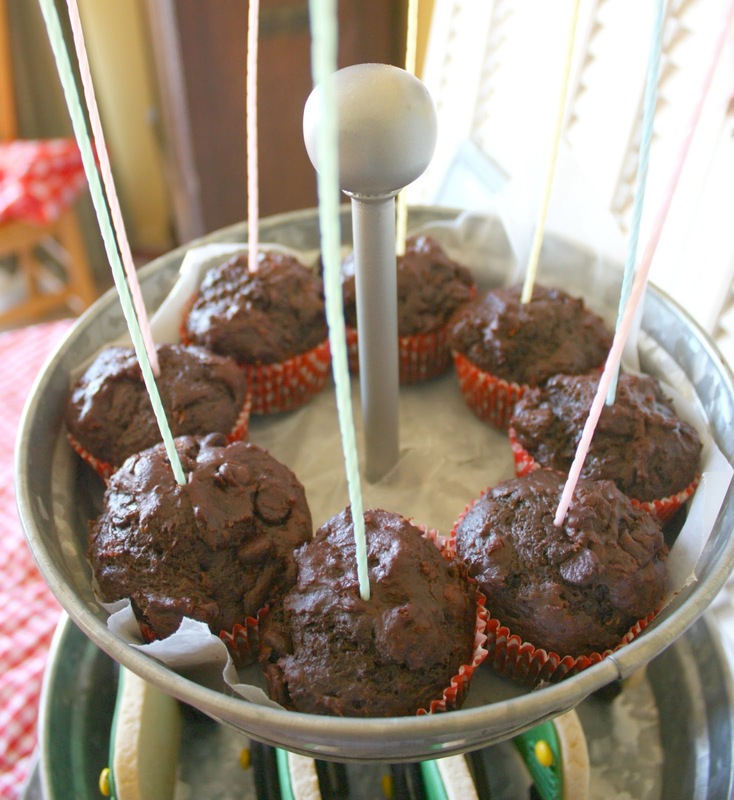 Each muffin had a tall candle lit as everyone sang "Happy Birthday". All of the kids loved the muffins! We also had cocoa oatmeal cookies (cow pies for the party) which is now a third generation favorite:) I made peanut butter balls too, a recipe I first got from my sister many years ago. I made some simply designed horse cookies too. As a child I learned to make a horse head by outlining my foot onto a piece of paper and then adding simple details to turn my footprint into a horse's head. I knew that would easily convert to a cookie. I had a grandson (almost 2) stand on a piece of paper and I traced around his bare foot, then transferred it to a file folder and cut it out (with no toe detail) to use as a template for the horse head. After I cut out the foot/horse head from the cookie dough and placed it on the baking sheet, I adhered little triangles to the top of the head for the ears. I was pretty happy with how they turned out. 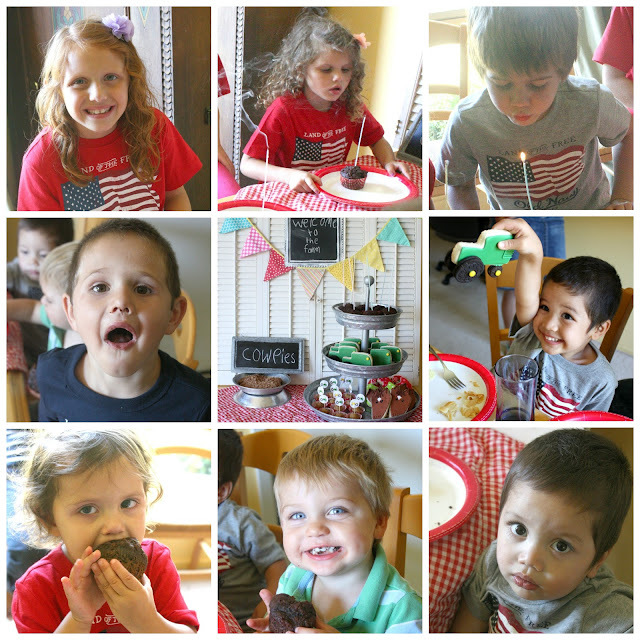 Well, I will most likely have more posts in the near future relating to this birthday bash (including the muffin recipe), but since I have been in a blogging slump for a few weeks now, I had better push the "publish" button before more time passes. Heat oven to 400 degrees. Put cupcake liners in a twelve cup muffin pan, or spray with non-stick cooking spray. In large bowl stir flour, sugar, cocoa, baking powder, baking soda and salt until well mixed. In a small bowl, whisk yogurt, mashed sweet potato, egg, oil and vanilla until blended. Stir in zucchini. Add, all at once, to flour mixture and stir just until moistened. Divide among muffin cups. Bake 19 minutes until wooden pick inserted in centers comes out clean. Leave in pan 5 minutes, then place on wire rack. Oh you are the funnest grandma, plus responsible too - I like the fruit snacks :)How sweet to use your grandson's footprint for the cookies, I am sure he loved that. Looking forward to seeing any more you have time to share. agree with Linda, you are THE best grandma! I'm sure your munchkins loved it! We are so lucky to have such a nice mom/grandma to bless us with her talents! Such cute ideas. You are very talented too. 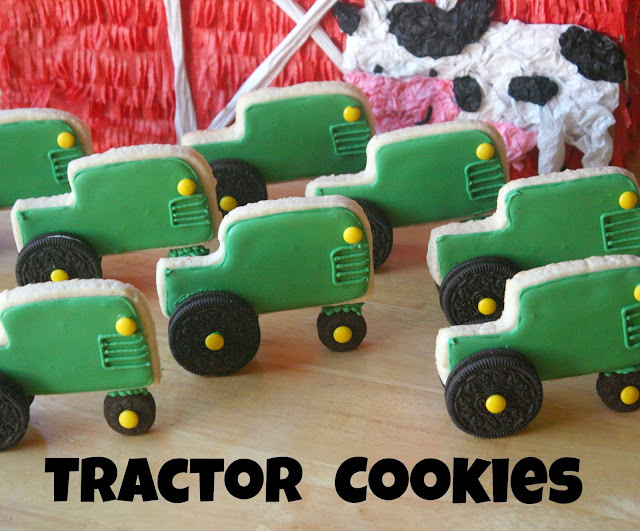 The tractor cookies are so fun! I love the cookie tires. What a fun birthday party!! I just found your blog today for some of your patriotic jello cookies! I just might have to try those this week. I love the birthday thought for all your grandkids! You must be one awesome grandma! Looking forward to the muffin recipe! What a cute idea!!!! Love the theme!! 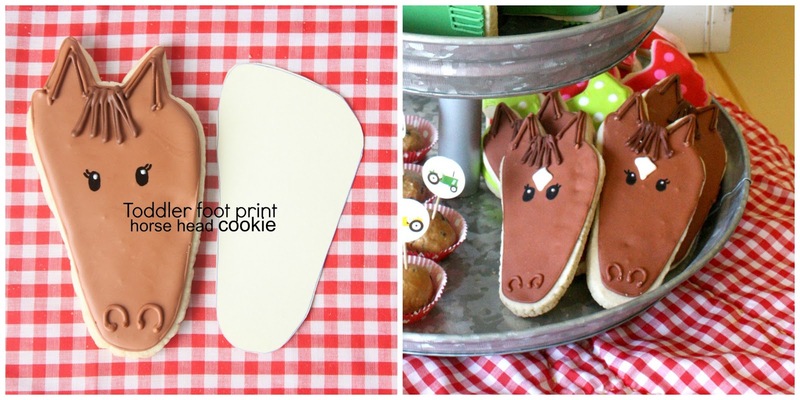 What a great idea about the footprint horse! Lucky grandkids. What a fun idea! What a fun party... I bet all of your munchkins had a fabulous time! No stinking way! How fun! LOVE your cookies. And the Cow Pies are hysterical! You have very lucky little munchkins! That's us so funny that you said that about the horse face! I learned that when I was little too! I live everything about this party. Those tractors are so special!